All of my theatre and kids sewing projects lately have got me pining away to make something for myself. A sensible person might just take a break from any kind of sewing at all. But I think I may have a problem. Seriously, my brain is tired from writing tutorials, drafting patterns, and frankensteining existing patterns to make things like jodphurs and pumpkin shorts for big huge men! I just want to follow a pattern and make something cute for me. 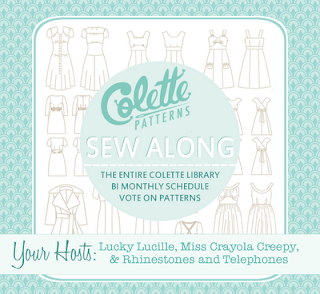 I stumbled across a Sew A Long going on at Rhinestones and Telephones the other day and I was just in time to join in on the Colette Patterns Sew A Long! There are some great bloggers guest posting and all sorts of fun info about things like how to do a Full Bust Adjustment. They actually make it seem fun! I love the patterns and have made a few. They are well drafted and usually fit me with few adjustments needed. 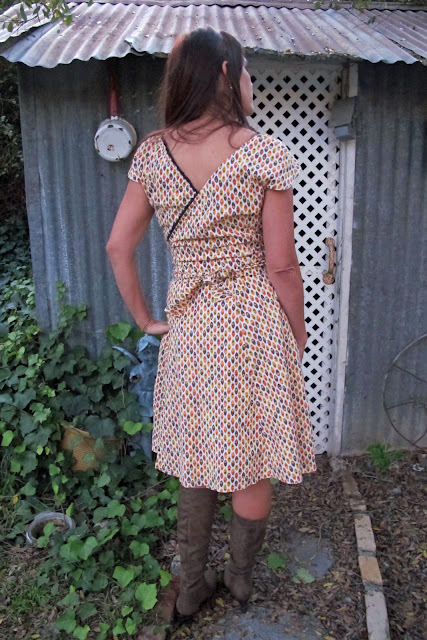 The first dress being made in the Sew A Long is the Hazel Pattern. Here are some photos from the Colette Site. I can’t decise to make mine from an old vintage tablecloth, seersucker with red piping or blue chambray with red gingham piping. Which would you make? This week the Sew A Long has been focusing on bust fitting issues and making muslins. I don’t have time to go through all that and just finished taping up my downloadable pattern so I’m just going to get started without a muslin. 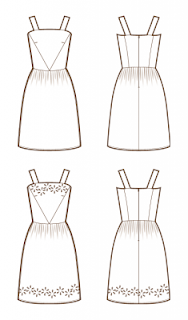 BTW, some of the Colette patterns are available as instant downloads now. I still prefer having an actual paper pattern as taping together 30 pieces of paper is a real hassle. But I wanted to work on the dress over the weekend so I just went ahead and bought the downloadable version. 1. I am too cheap to buy them. 2. I have been trying to draft my own patterns more and more. 3. I have similar styles in my vintage pattern collection. Colette Oolong in stretch cotton knit. Love that cheesecake shot! Oolong in velvet with added godets. 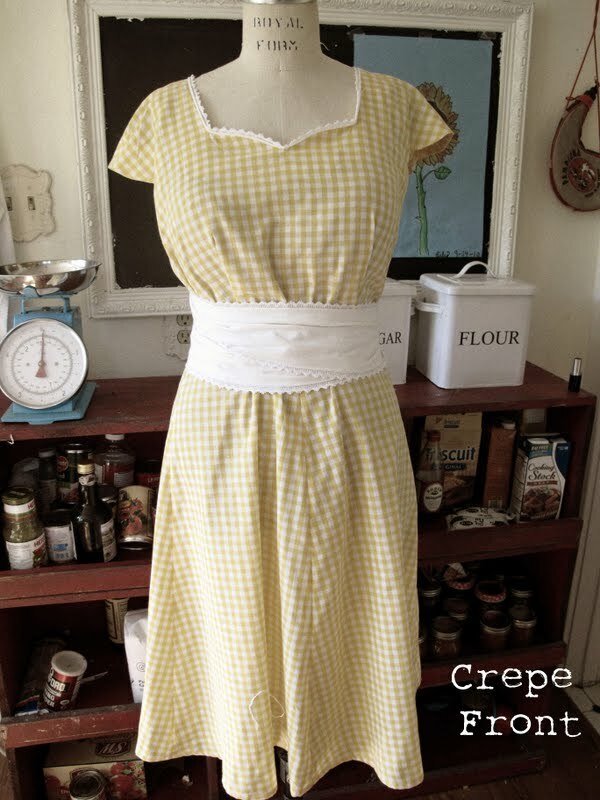 Crepe in a vintage cotton. I love the crepe on you. I wanted to make it this summer, but the weather has been so bad it’s still on the dream list! 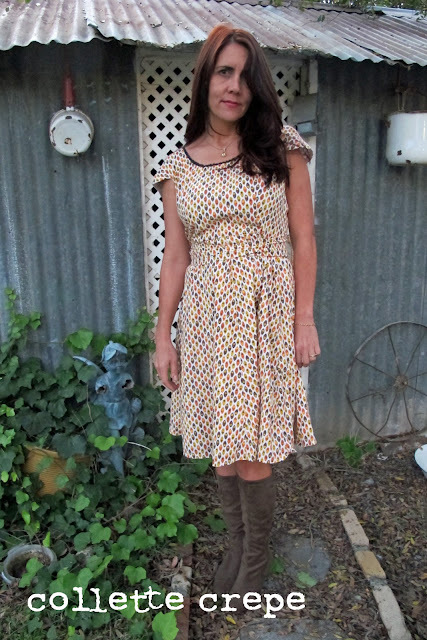 I also agree that there are a good few vintage patterns very similar, I’m thinking pastille dress. I love the meringue skirt, I made a good version in denim and wear it all the time. Good luck, hope you find something just for you. 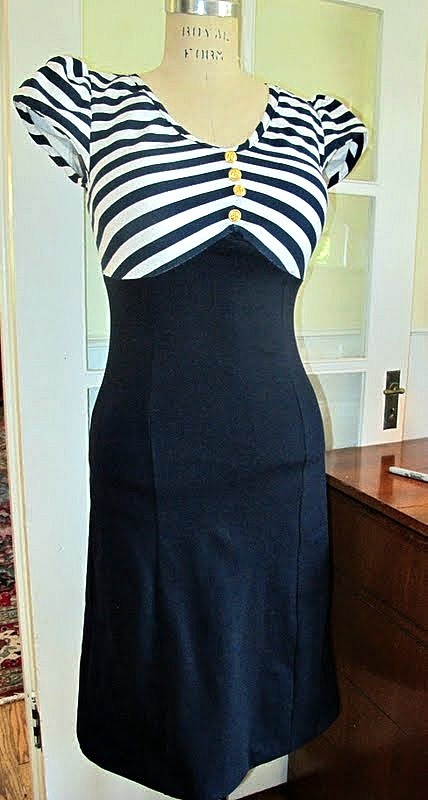 That sailor dress is out of control awesome! 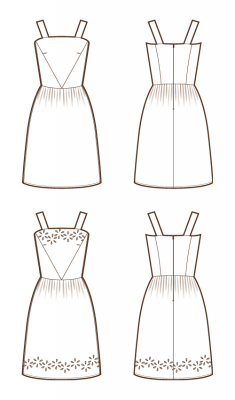 If you haven’t cut and taped the Hazel pattern yet–since the skirt is just a pair of big rectangles, you can actually skip a lot of the assembly by just measuring those pieces out on your fabric, or measuring them and cutting out newspaper or tracing paper, instead of bothering with the pattern pieces. That’s what I did and it worked just fine! The velvet Oolong is amazing!!!! 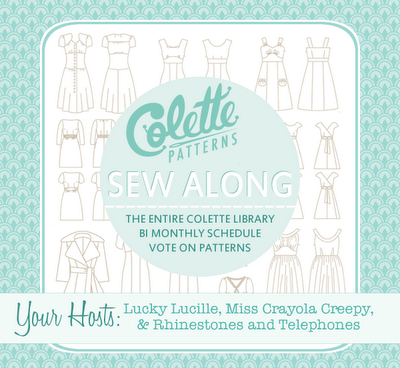 I haven’t tried any Colette patterns yet but I have been meaning to. 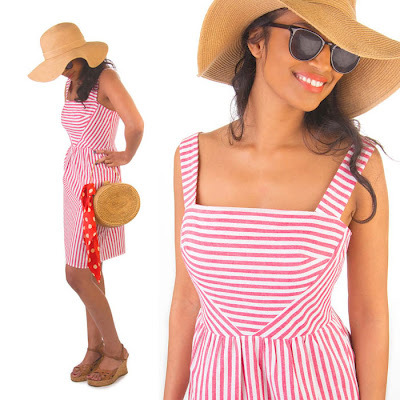 When school lets out for the summer I plan to sew for 6 weeks straight…I may have to download a few patterns from the Colette site.